Two years ago, in the middle of the 2016 presidential race, the senior-most members of the Trump campaign—Donald Trump Jr., Campaign Chairman Paul Manafort, and Trump’s son-in-law Jared Kushner—met in Trump Tower with Russian operatives with close ties to the Kremlin. The attendees and President Donald Trump’s defenders have argued that the meeting was not collusion. But in the year since the meeting’s existence was revealed, a trove of documents released to the public, including emails and other communications between the meeting’s participants, has demonstrated otherwise. Before the meeting, both sides explicitly agreed on the meeting’s purpose: The Russian government would provide damaging information on Hillary Clinton as part of its ongoing support of the Trump campaign. At every opportunity, those involved in the meeting lied to cover up its existence and hide what was discussed. After the meeting was revealed, the people involved panicked, recognizing that it was collusion. In sum, the people involved knew there was collusion, which is why they tried to cover it up. This is clear just by reading their own words. 1. Before the meeting, both sides explicitly agreed on the purpose of the meeting: The Russian government would provide damaging information on Hillary Clinton as part of its ongoing support of the Trump campaign. 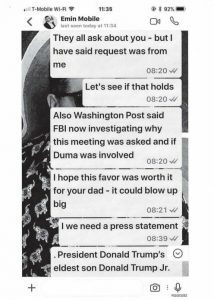 June 3, 2016: Trump Jr. responded to the inquiry, accepting the Kremlin’s help and providing strategic guidance on the timing of the potential release of the information, based on when it would be most advantageous for the campaign. 2. At every opportunity, those involved lied to cover up its existence and conceal what was discussed. Trump Jr. issued a statement saying: “It was a short introductory meeting. I asked Jared [Kushner] and Paul [Manafort] to stop by. We primarily discussed a program about the adoption of Russian children that was active and popular with American families years ago and was since ended by the Russian government, but it was not a campaign issue at the time and there was no follow up. July 9, 2017: The New York Times broke the news that Trump Jr. was promised damaging information on Clinton before agreeing to the meeting. July 10, 2017: The New York Times reported that Trump Jr. was told that the compromising information about Clinton was part of a Russian effort to help his campaign. 3. After the meeting came to light, the people involved panicked that it was revealed, recognizing that it was collusion. On the Trump side, senior officials, including President Trump, attempted to downplay the meeting and the president’s involvement in crafting the response. Publicly, however, the Trump White House repeatedly denied that the President was involved in the statement’s drafting. On July 31, 2017, reporting from The Washington Post revealed that the President did, in fact, help dictate the misleading statement. In response, on August 1, 2017, the White House claimed that the President only “weighed in” on Trump Jr.’s statement. On January 29, 2018, in a confidential letter to Special Counsel Robert Mueller, Trump’s legal team finally acknowledged that Trump “dictated” Trump Jr.’s first misleading statement, directly contradicting previous denials from Trump’s legal team and press office. While the Trump team tried to get their story straight, the other participants in the meeting tried to coordinate their response with representatives from the Trump team, as seen in private conversations obtained and released by the Senate Judiciary Committee. 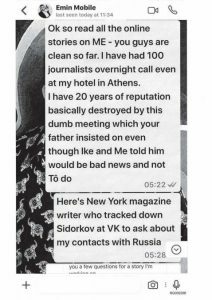 July 9-10: Goldstone admits to Emin Agalarov, son of the Russian oligarch, that he is lying to the press about the origins/purpose of the meeting. July 9: Goldstone continues to coordinate a response. 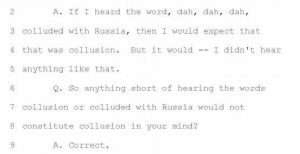 In his testimony before the Senate Judiciary Committee, Goldstone denied that any collusion had taken place, but struggled to actually define it. 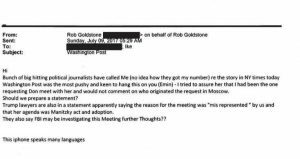 The participants of the June 9 meeting clearly knew it was collusion, and they made a coordinated and concerted effort to cover it up. In doing so, they ended up contradicting their own stories. 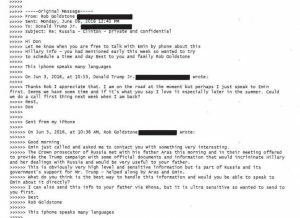 Despite Trump Jr.’s previous statements that there was no follow-up from the meeting, Goldstone sent an email later in the summer to Trump Jr. and Trump associate Dan Scavino, currently the White House Director for Social Media, “following up” on a topic he discussed with Trump Jr. and Manafort at the meeting: having the Russians encourage Russian-Americans to vote for Trump by creating a page on the Russian social networking site VK. The June 9 meeting gives us a window into the Trump campaign’s corrupt approach to the election. 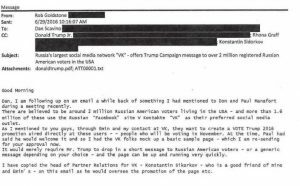 The statements, emails, and texts from the participants make one thing very clear: The senior-most members of Trump’s team willingly and knowingly attended a meeting whose purpose was collusion with a hostile foreign power. From the initial emails setting up the meeting to the eventual efforts to cover it up, their own words give them away.